EIE Challenge Tip of the Day 19: Treat yourself with a nice relaxing Epsom salt bath. It is only $1 for a 1lb bag at Dollar Tree. Drop all of it in a warm tub and relax for 15 minutes. Beware, you might have the best sleep of your life after. See a list of other benefits here. Friday Night Lights again at MDR from 5p-8p! Last week was a blast and this week is going to be the same! Notes: This workout begins from a standing position and with the barbell on the ground, loaded to the appropriate weight. For the Shoulder to overhead to count, the barbell will move from the shoulders to the overhead position with the knees, hips and shoulders extended in one line. After the 5 reps, they will use the same barbell to perform the Deadlift. After 10 Deadlifts they will move to the box. 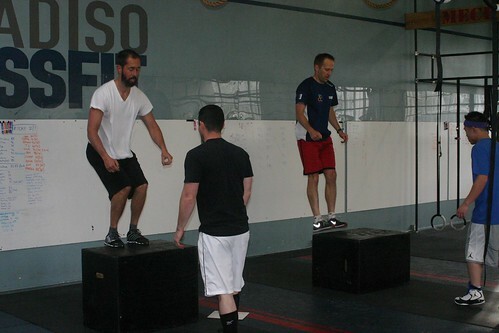 The athlete will start with two feet on the ground and come to a standing position with knees and hips locked out on top of the box. Two-foot jumps, one-foot jumps and step-ups are all permitted. Click here to review the workout description, standards, PDF and scoresheet. If you weren’t at Friday Night Lights last week check out the trailer of Workout 13.1! Workout 13.2 is tough and will test your lungs. The weight is light enough to make it a 10 minute sprint in order to score well. Check out the video of Martina and Diso performing the workout yesterday and let the strategizing begin! And one final shout out to everyone running the marathon this weekend! Post to comments if you are racing! Whether you are nervous for the marathon or for workout 13.2, relax and don’t have a taper tamptrum! Trust in your training and you will be fine! m) – n. 1) a roller coaster of emotions and paranoia where you overanalyze everything while tapering 2) the phantom pains, panic attacks, and other physical and mental symptoms that magically appear during a taper that were never present during training. I stepped out of my car and my calf cramped up for no reason. What am I going to do about this weekend? Dude, stop throwing a taper tantrum, you’re fine.